Op 1 Oktober het ŉ groep van FEBA Radio Suid-Afrika se spanlede na Lichinga, die hoofstad van die Niassa-provinsie in Mosambiek, gereis om die nuwe stasiegebou van Radio FOT (Fountain of Truth) te besoek. Die stasiegebou is nou in die finale fase van konstruksie. Die gebou is ŉ ware voorbeeld van die Here se guns en goedheid teenoor die Yao-Moslems van Noord-Mosambiek en FEBA Radio Suid-Afrika se bediening. Gedurende die sewe dae uitreik, het die span baie hard gewerk ter afronding van die gebou. Die Suid-Afrikaanse span se besoek aan die stasie het die plaaslike span aangemoedig om tydens hierdie finale fase vorentoe te beweeg met nuwe moed. ŉ Paar dae voor die span se aankoms, is die uitsaai-toring van die ou perseel na die nuwe perseel verskuif. Na ŉ paar dae se harde werk is die installasie van die toring voltooi en aan die sender gekoppel. Intussen het FEBA Radio Suid-Afrika se span ook na Chiconono gereis om Radio Chiuanjota te besoek, wat tans as ŉ herleistasie vir Radio FOT sal dien. Radio FOT is baie effektief in hul pogings om uit te reik na die gemeenskap met die liefde van Jesus, veral in ŉ land wat swaarkry a.g.v. armoede, siekte en hopeloosheid. Dit is as gevolg van hul liefde, dat die harte van Yao-Moslems oop is om Jesus Christus as hul Heer en Verlosser te ontvang. Ons dank die Here vir sy seëninge en oorvloedige genade gedurende die konstruksieproses van die nuwe stasiegebou. Die uitsendings vanaf hierdie stasie sal verseker dat die lewens van miljoene Yao-Moslems regoor hierdie land aangeraak word. On the 1st of October, members of FEBA Radio South Africa’s team travelled to Lichinga, the capital city of Niassa province in Mozambique. There, they visited Radio FOT’s (Fountain of Truth) new station building which is currently undergoing rigorous construction and is nearing completion. The building is magnificent – a true accomplishment and representation of the Lord’s favour and goodness towards the Yao Muslims of northern Mozambique and FEBA Radio South Africa’s ministry. Over the course of seven days the team worked hard to assist with final touches to the building. The visit brought encouragement to the workers and local staff who were inspired by our team’s passion and determination. Just a few days before our arrival the transmitter tower was transferred from the old building to the new building. After a few days of hard work the local team was able to complete the installation of the tower and connect it to the transmitter to commence with broadcasting that had been put on hold for a few weeks. 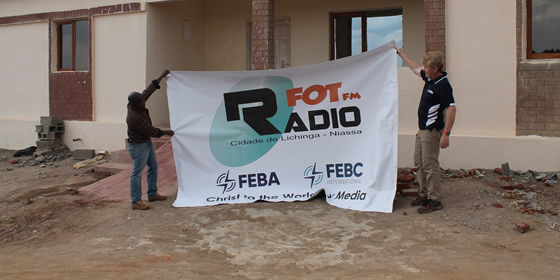 During this time, FEBA Radio South Africa’s team also journeyed to Chiconono to visit Radio Chiuanjota which will serve as a relay station for Radio FOT for the time being. Radio FOT, originally established in 2016, reaches approximately 5.3 million people across the Niassa province. Its reach also extends to parts of Malawi, Tanzania and to all the northern most parts of Mozambique, all the way up to the Nangade district in Cabo Delgado. The station hosts a team of well abled, determined and passionate staff members comprising of journalists, broadcasters and sound engineers, who have implemented innovative strategies to deliver the gospel to the Yao Muslims in surrounding areas. The station also manages a successful network of over 2000 listener clubs. According to station manager Mr Bright Sonjera, Yao Muslims of Mozambique are uncommonly open to the gospel, now more than ever before. He says, “The way in which we bring the gospel to the Yao Muslims is first by helping them, caring for them and encouraging them in their situation.” In a country that is rampant with poverty, disease and hopelessness, Radio FOT has been especially effective in reaching out to the community with the love of Jesus which has in turn opened the hearts of the people to receive Jesus Christ as their Lord and Saviour. We thank the Lord for his blessings and abundant grace throughout the entire construction process of the new Radio FOT station building in Lichinga. The station’s broadcasts are sure to impact the lives of millions of Yao Muslims across the country.